That sounds good and looks delicious. This looks wonderful. I am going to have seafood Christmas dinner. This would be great to have with what I am serving. Yum!! Thanks for sharing. I might attempt this for our Christmas holidays. I can imagine how good that must have smelled. I rarely get oysters anymore as they are so expensive and you don't want to be buying old ones, yuk. Anyway, they are such a good holiday treat. Wowza. 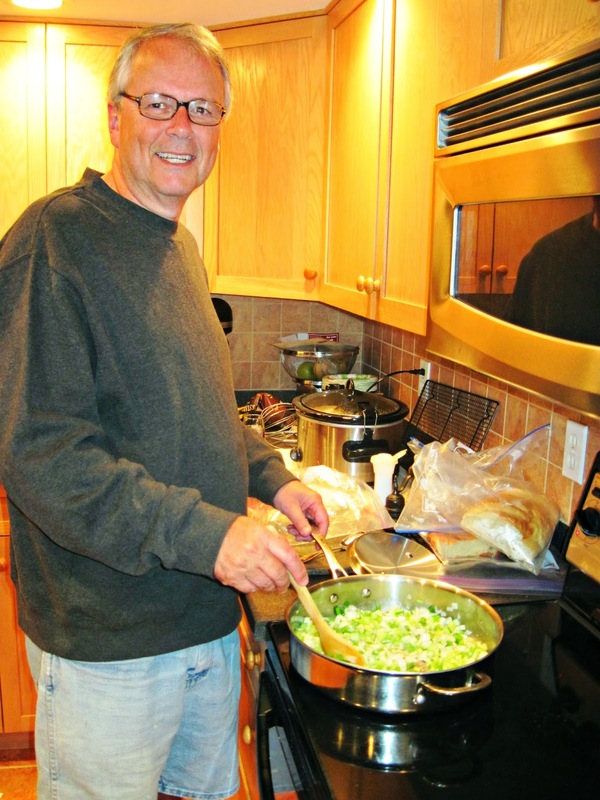 Your dadi is quite a cook…and very handsome too!!! Looks and sounds really good. Thanks for the recipe! oh yummy!! my husband's family used to make oyster stuffing, i loved it! I don't love oysters but I sure love stuffing! It is the best part. Yum. 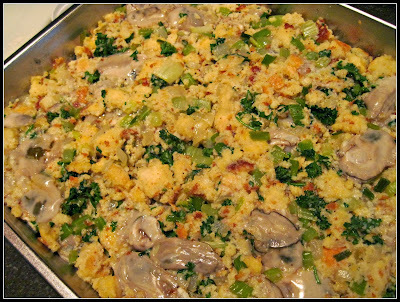 I have never tried oyster stuffing, but on Christmas Eve my inlaws do the 7 fishes and this would be a great addition. The stuffing looks so good! My husband likes oysters, I may have to try this for him! Yummy. I am getting hungry just watching your father cook. Thank you for sharing the recipe. This sounds so delicious and fresh, especially with the breads made from scratch! I've never eaten oyster stuffing. I think I've been missing out. Love the photo of your dad in the kitchen. You favor him. 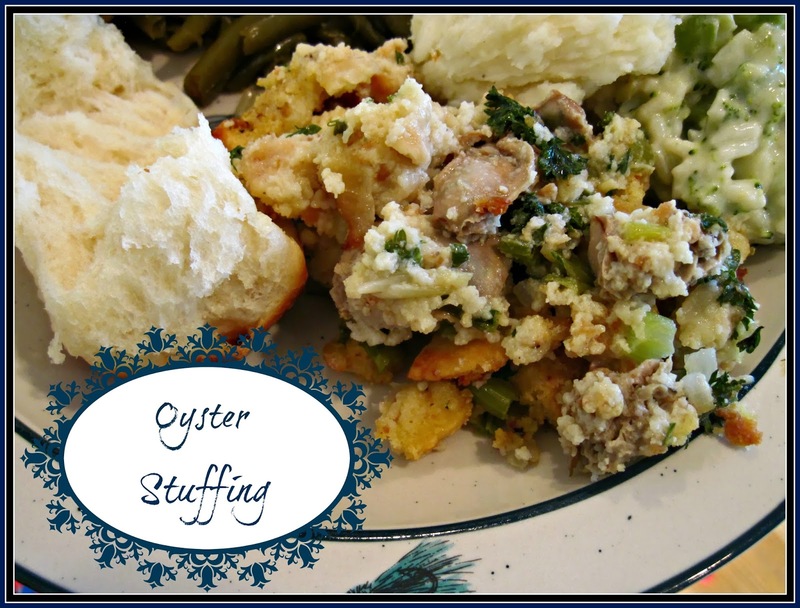 And I have been asking anyone and everyone for a stuffing recipe, my hubby suggested an Oyster 'farcie' stuffing-this is perfect, he does our baguettes and will shuck the Oysters and I think I can do the cornbread :-), glad you shared this. Great photo of your Dad! As I don't like oysters, I'd replace it with chicken. But it surely looks delicious for oyster fans! He looks delighted to be making it. :) Thank you for the nice recipe share! Sounds good, except for the oysters part! Never did develop a liking for oysters or clams. I'd likely substitute ground sausage, or maybe chopped nuts. He uses quite a few ingredients and takes his time, it must be delicious! Oyster dressing was always made by my Mother for the holidays and now we carry on the tradition too! Well dang! I wanted to have oyster stew for our Christmas - which we celebrated on Sunday, but when I asked my daughter if she knew of a good recipe, she said "no" in a tone that meant she didn't intend to ever have a recipe for one. I love that first photo! This sounds delicious, I adore oysters -thanks for sharing recipe! Yum! I'm coming over for dinner! It really does sound good to us! Great photo of your Dad. This looks so good that The Barefoot Contessa may be cancelled from her TV show, Lisa! ;) Wow. What a recipie! Thank you for the recipe, I will have to try it someday. Oh! If that handsome gentleman is your father, he is certainly a very good looking man. I think you look like your daddy. You are a beautiful lady, Lisa. Thank you for your lovely comments in my blogs, and kind emails! Have a blessed time, darling!